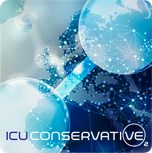 ICU-Conservative O2 is a multicentre randomised open label clinical trial comparing conservative with conventional oxygen administration in critically ill patients in ICUs in different countries. The purpose of this study is to assess whether, in a wide population of mechanically critically ill patients, the strict maintenance of a state of normoxia, by application of a defined protocol, could be beneficial in terms of ICU mortality, incidence of organ failure and new outbreaks of infections if compared to the application of more liberal strategies of oxygen administration. This project was initiated by the ESICM SIS Section. The primary objective is to verify that strict maintenance of nomoxia improves survival in a wide population of mechanically ventilated critically ill patients compared to the application of conventional, more liberal strategies of oxygen administration. Survival will be measured at ICU discharge. The study is designed as multicentre, open label, two parallel group, randomised superiority clinical trial. The included patients will be randomised in a 1:1 ratio into the conservative and conventional groups. It will be single blinded (patient): after the clinician provides information for informed consent, patients (and their family members) will be told to disregard the randomisation group and any detail about the oxygen administration strategy. Assuming a two-sided alpha level of <0.05 and a power of 80%, we calculated that 460 patients are needed per arm to detect a relative risk reduction of 40% (absolute risk reduction of 6%) compared to a mortality of 15% observed in conventional group patients in previous studies. The global sample size is established to 1000 patients. This includes an additional 80 participants to allow for drop-outs and an expected temporal trend of reducing mortality at ICU discharge. On ICU admission, or later when they fulfil eligibility criteria, patients will be randomly assigned to a group of liberal conventional oxygen administration (CONVENTIONAL) or a group of conservative experimental oxygen administration (CONSERVATIVE). The study is conceived as single blinded: only the patients will not be aware of the received treatment. The duration of the study therapy will be until discharge from the study ICU regardless of the type of ventilation. Yes. The EC approval for the lead centre is to be expected for mid-September 2018. A provisional list of participating centres has been set. Should registration open for other sites, information will be made available here. This project received the 2017 ESICM Trials Group award, which includes a grant of €50,000.